The old Town of Milwaukee area produced five of the county’s northeast suburbs, including Whitefish Bay (1892), East Milwaukee (1900) now called Shorewood (1917), Fox Point (1926), River Hills (1930), and Glendale (1950). The creation of the last municipality removed the remaining vestiges of the Town of Milwaukee. Residents of Glendale, however, believed the old town hall was worth preserving. Through the efforts of the Glendale Women’s Club, the building was moved from its former site at 528 Bender Road to the present site in 1963. The modest frame building was erected in 1872 at the cost of $800 on donated land. It measures only 30 by 20 feet. This structure served as a meeting and voting hall as well as a social gathering place before the turn of the century. The Glendale Women’s Club has restored both the interior and exterior to their original appearance using donated labor and materials. The restoration was a community effort and included researching early town meeting records to determine the authentic color and furnishings of the building. The hall’s interior contains furnishings and historical artifacts relating to the Town of Milwaukee’s early years. Completed in 1910, Elderwood was designed by Milwaukee architect Eugene Liebert and reflects the influence of his native German background and professional education. Since native clay was scarce at the site, Liebert chose the modern method of poured concrete covered with stucco to create an old-world effect, complete with a red tile roof. The leaded glass windows and carved wooden decorations in the house’s interior are of the German Arts and Crafts movement and Shingle Style design. The house was originally built for Charles Solomon, a Milwaukee decorator and designer. From 1912 to 1936 it was a summer home for Gustav J.A. Trostel, operator of the Albert Trostel and Sons Company, Milwaukee’s largest leather tannery. 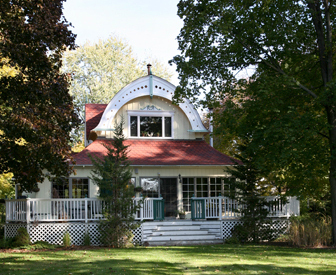 Trostel developed the adjacent acreage into a private botanical garden and farm. Later, the Nicolet School District used the house for its American Studies program until 1978 when the program was discontinued. In 1835, Gordon Hubbard (after whom Hubbard Park is named) bought the land where The Silver Spring House is now located. In 1854, Valentine Blatz, owner of the brewery named after him, and Charles Kern bought the land and subdivided it into smaller tracts. 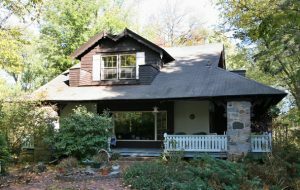 The land that The Silver Spring House now occupies was purchased by Charles Krocker, who, in 1856, built a log cabin tavern, the Krocker House. On March 3, 1902, a Krocker heir sold his share of five acres and the fire-damaged Krocker House to John Kleist. Two years later Kleist built and named his tavern The Silver Spring House, which is presently the back dining room. The main dining room, formerly a dance hall, was located behind the original tavern. In 1915, it was rolled on logs to its present location. In the ensuing years, The Silver Spring House changed hands several times but always offered food and libations. 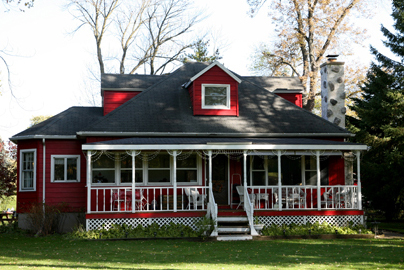 It is a throw-back to the rural roadhouse / tavern facility common to the historic Town of Milwaukee area. The residence was one of three summer homes designed for family members by prominent Milwaukee architect Eugene Liebert. Liebert designed many commercial buildings and private residences for the city’s best-known German families during the late 1800s and early 1900s. Just after 1900, he purchased several acres of land on the east bank of the Milwaukee River, across from what is now Kletzsch Park. On the parcel farthest to the north, Liebert designed a summer home for his family utilizing a Schwarzwald theme that incorporated field stone, half-timbering and scroll-cut brackets. A barn behind the home was designed with a water tank on the roof into which river water could be pumped and which could then be gravity-fed to the home’s extensive lawns and gardens. The property is designated for its architectural significance. The residence was one of three summer homes designed for family members by prominent Milwaukee architect Eugene Liebert. Liebert designed many commercial buildings and private residences for the city’s best-known German families during the late 1800s and early 1900s. Just after 1900, he purchased several acres of land on the east bank of the Milwaukee River, across from what is now Kletzsch Park. On the parcel south of his family’s summer home, Liebert designed a home for his sister-in-law, Louise Logemann, and her husband Franklin Giesler. Giesler was an engineer, and he wanted to show his skill by having his unusual “tornado proof” roof made from rolled angle irons. The property is designated for its architectural significance. The residence was one of three summer homes designed for family members by prominent Milwaukee architect Eugene Liebert. Liebert designed many commercial buildings and private residences for the city’s best-known German families during the late 1800s and early 1900s. Just after 1900, he purchased several acres of land on the east bank of the Milwaukee River, across from what is now Kletzsch Park. On the second parcel south of his family’s summer home, Liebert designed a home for his brother-in-law, Otto Logemann, in a cottage style with a wrap-around porch. The property is designated for its architectural significance.